A tribute to real friend and very close companion. This is a tribute to a truly great Gordon, a fellow who absolutely loved showing and performing in the show ring, but more than anything else Biggles was a family dog who could not be separated from his 'human' family and even now is with them and always will be. In 1992 a young pup from Kqrac (Victoria) joined Ricochez kennels with a view to increase the gene pool. 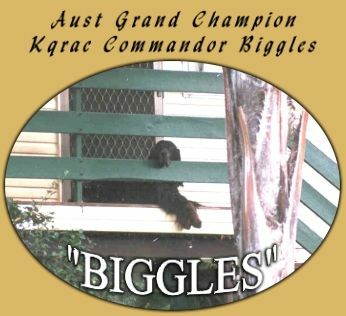 Biggles (Kqrac Commandor Biggles) soon became the household favourite with his exuberant, friendly and affectionate manner. Even at 11 years of age, he still thought and acted as a 6 month old pup – that is until he stepped into the show ring – then he became an extrovert who absolutely loved performing for the audience. Any wonder, he accumulated 14 All Breeds Best in Shows, too numerous Best in Groups and Royal Best of Breeds. His Crowning Glory is his Australian Grand Championship – completed with no less than a Best in Group at a major Brisbane All Breeds Show in October 1998. Soon after Biggles was diagnosed with an inoperable osteosarcoma of the nasal cavity and subsequently underwent a six month course of chemotherapy. He responded well during this time and had excellent quality of life. However about 6 weeks after this therapy he lost his brave battle and is now enjoying eternal life.